6 x IN, 8 x OUT 56bit Digital Audio Processor for Mobile/Car audio installations. Analog (High/Low) & Digital (SPDIF) inputs. 8 x Analog out. The miniDSP C-DSP 6x8 is a Digital Signal Processor (DSP) targeting mobile/car audio installations. Leveraging years of experience building reliable platforms, miniDSP engineered the C-DSP 6x8 to pack plenty of processing power and I/O into a small and sturdy enclosure—a perfect fit for installations with limited space. On the hardware side, the audio configuration of 6 x inputs (analog and digital) by 8 x outputs is perfect for multi-way setups. Don’t be fooled by its size or its price, this small enclosure packs high quality converters and enough DSP power to make your audio tweaking dreams come true. On the software side, the software application allows real time control of the unit via its driverless USB interface. 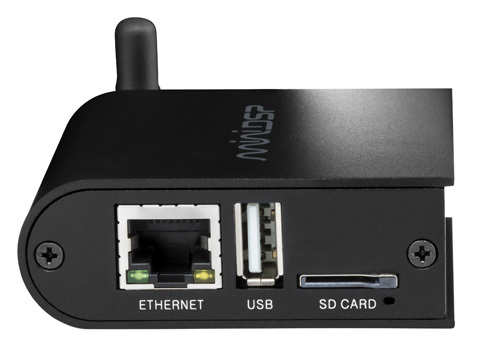 The onboard microSD card slot supports offline configuration and firmware updates if you ever miss your laptop. Finally, the C-DSP 6x8 will follow in the footsteps of our product line with constant upgrades via new plug-ins and new features. Stay tuned for an exciting new ride! I got into car audio in the late '80s. Now that my kids have cars they want theirs to sound like dads. After reading several good reviews on the DIY forums I decided to give it a try in a simple 3-way system in a 2001 Xterra. Infinity 12" sub, Seas tweeters, SB 6" mids. 500W total of old-school PPI. At a loss to describe this thing but I'll start with awesome. Dropped it in, plugged it up (read the directi and I've been tweaking this thing since. I used the UMIK-1 with REW and have it sounding better than 99% of what's on the road today. The flexibility is unbelievable. My prior experience was buying a x-over and turning a couple of pots to adjust x-over frequencies and gain. If you are remotely thinking about a multi-amp c volume, i.e. sub woofer as the RF unit can. Other than that, you are crazy not to consider this for your next car install. I'll be buying another one soon for my son's Tacoma. excellent product, outstanding technical support. minor issues at original setup but the support team was outstanding.